The Radio In A Box or RIAB is one of the more successful programs that have been introduced in the Afghan conflict. As most counterinsurgency experts know Information Operations or IO is extremely important to garner the support of the population for the counterinsurgency forces and the government that the insurgents oppose. In Afghanistan the RIABs have proved to be extremely successful in the IO fight. 1. Unfortunately the high command in Kabul (at least during the period of 2012 and early 2013) have had their blinders on and they are now in the process of dismantling one of the most cost effective methods of getting the ISAF and Afghan government message to the people. The worst of this situation is the equipment is easy to maintain, is being run by Afghans already, and is no use to the U.S. military. Hundreds of RIABs are going to be shipped to the United States at great cost and they will sit on an Army post and rust away. In the near future (2013-2014), hard-earned gains in the development of the IO capability of the ANSF will be wasted away. However, one regional command is actually doing the right thing. RC South is in the process of transferring over 30 RIABs to the ANA utilizing the Foreign Excess Personal Property (FEPP) program. Along with the transfer of the RIABs RC South is also providing training so that the ANA can operate and maintain the equipment. In addition, RC South is assisting the ANA with a fielding plan that includes the provision of excess RIABs to be used as spare parts and for training. 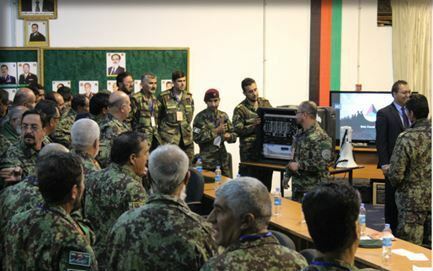 Some regional commands continued their support for transferring RIABs to the ANSF into 2014 and beyond. TAAC North provided the 209th ANA Corps with a RIAB in May 2015. Along with the providing of the equipment TAAC North assisted by the Regional Media Information Center (RMIC) provided a media training course for the 209th ANA Corps. 4. Program Content. The programs run on the radio are varied. The stations play traditional Afghan music, reports the news, and plays messages provided by the Government of Afghanistan and the U.S. military. There are a varity of topics aired to include health tips, literacy classes, calls for prayer and more. It is quite common for local government officials, police, and military commander's to go on the air to give speeches, conduct call-in radio shows, and provide information to the public. These programs are very successful and can help counter the Taliban propaganda campaign. Afghan DJs. 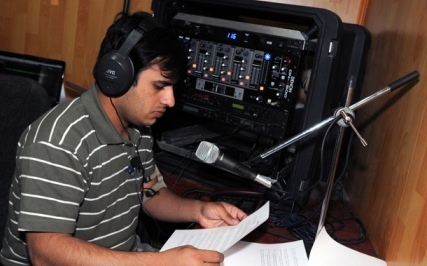 The RIAB contract provides for the hiring and training of Afghans to run the RIAB station and to be the on-air disc jockey. Many of the DJs will conduct live talk radio shows that allow listeners to call in to the radio station on the air. Some of these DJs have worked for the RIAB stations for a few years becoming very professional in their duties, developing a loyal listening audience, and helping to provide an avenue for the Afghan government to get its message across to a population with a high literacy rate. Cost of Radio Equipment. The equipment for the RIAB is not costly once wieghed with the great benefits. A guess would put the cost of the commercially available equipment (COTS) at less than $10,000 for each unit. 2. Other sources indicated that the cost is $15,000 for the initial purchase, transport and installation of the equipment and then an additional $12,000 a year to pay the local RIAB staff and operating costs. 3. Components of the Radio in a Box. The equipment that makes up a RIAB is a simple transmitter, a laptop computer, an antenna, and an electrical source (small generator will do). This equipment is easily transportable and maintained. RIABs Fill a Void. In many rural areas of Afghanistan there is no cell phone coverage, no televisions or television broadcast stations, few radio stations, limited newspapers, a mostly illiterate population. News travels by word of month. The Radio in a Box can fill that information void very cheaply and with a pro-government of Afghanistan slant to the news. Small Low Cost Radios Distributed. In many areas of Afghanistan ISAF has distributed thousands of AM-FM radios that are powered either by the sun or a hand crank. For some poor, remote villages the RIAB is their only source of news other than verbal person-to-person communication. WikipediA. Information about the Radio-in-a-Box (RIAB) used to broadcast news, music and other programming in Afghanistan. Ramsey Electronics. This firm is one of the commercial enterprises that has provided the RIAB to the military. Tim Foxley, "Countering Taligan Information Operations in Afghanistan", The Prism, 1, No. 4, September 2010, pages 79-94. Foxley is a researcher in the Armed Conflicts and Conflict Management Programme at the Stockholm International Peace Research Institute (SIPRI). Accessed here on Nov 9, 2012. Tim Foxley, The Battle for Hearts and Minds in Afghanistan: the effectiveness of Taliban Information Operations and related communications activities, March 2009. A paper for the Swedish Armed Forces accessed here on Nov 9, 2012. USSOCOM, "Village Stability Operations - 101", The Donovon Review, January 2012. United States Special Operations Command, Directorate for Intelligence. see page 20 for a short explanation of the importance of IO and the RIAB in VSO. Bolduc, Colonel Donald C., "Forecasting the Future of Afghanistan", Special Warfare, October-December 2011. In the article the author, former commander of the CJSOTF-A, speaks ofthe importance of IO supporting the Village Stability Operations (VSO) program and how RIAB was part of that effort. AAR, Afghan Commander AAR Book, Currahee Edition, Septemer 2009. See page 29-30 for an AAR on effectiveness ofthe RIAB. November 13, 2013. RIAB Training B-Roll, DVIDS. Video of Captain Thomas of 3rd Infantry Division at FOB Shank in Logar province taining ANA soldiers about the RIAB. 15 mins. November 27, 2012. "Ashura Radio In A Box Message". DVIDS. A mullah of the 203rd ANA Corps records a message that is to be disseminated over RIABs. November 2, 2012. "RIAB Disassembly at COP Sharp". DVIDS Video. In a controversial move the U.S. military is disassembling RIABs throughout Afghanistan that will be stored in a JPAT on a large FOB in Afghanistan and then finally destroyed prior to 2014 rather than turning the inexpensive and outdated equipment over to the ANA or the local provincial or district government allowing the Afghans to continue the information operations messaging that is so important in a COIN fight. Why are we shutting down the RIABs? No one seems to have a good answer for it. November 2, 2012. "RIAB Tower Disassembly at COP Marjeh". DVIDS Video. The Radio in a Box is turned off at COP Marjeh, Helmand Province, Afghanistan. October 4, 2011. "Influence Through the Airways - RIAB Messages". DIVIDS Video. RIAB messages provide local area residents of Khan Neshin with fast and reliable way of remaining informed on various topics. June 10, 2010. "Radio in a Box". AFNAfghan on YouTube.com. Video about Afghan radio station on FOB Sharana. March 15, 2018. "Marines look to beef psychoglogical ops with a radio station in a box", Marine Corps Times. September 16, 2013. "ANA completes radio broadcast training to lead communication efforts". DVIDS. 4th Inf BCT, 3rd Inf Div has success transferring RIAB ownership to ANA. November 30, 2012. "You're on the air". The Spirit of America. May 21, 2012. "ANSF takes the lead in information fight". RC East. The article is also available at CENTCOM. February 16, 2012. "The 'Voice of Shinkai': Rock Star status in a box". NTM-A News. RIAB supports Radio Literacy Program. January 9, 2012. "Afghan announcers broadcast peace to listeners". U.S. Air Force. December 1, 2011. "Contract Award: Ramsey Electronics Wins Federal Modification Contract for Radio in a Box (RIAB)". Highbeem.com. November 7, 2011. "Bringing News From a NATO Perspective to Afghans". NPR. November 5, 2011. "The busiest man in Nawa". ISAF News. The District Governor of Nawa district, Helmand province uses a RIAB to get the government message to the people. Nobember 7, 2011. "NATO turns to radio to try and get its own message to the Afghan people". Public Radio International. August 25, 2011. "In Afghan fight, U.S. takes to the airwaves". The Washington Post. July 27, 2011. "Reaching Afghanistan with Radio in a Box". PSNEurope. July 18, 2011. 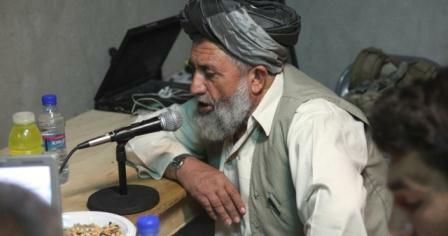 "Radio-in-a-Box: Afghanistan's New Warrior-DJs (Part 2)". The Huffington Post. July 13, 2011. "Radio-in-a-Box: Afghanistan's New Warrior-DJs". The Huffington Post. June 23, 2011. "Radio In A Box: PSYOPS, Afghanistan and the Aesthetics of the Low Tech". USC CPD Blog. October 20, 2010. "Army reservist fights information war in Afghanistan". Army.mil. February 5, 2006. "UNESCO helps ABU to develop low-cost broadcasting system". UNESCO. 1. For more on how RIAB supports IO see Information Operations, Finding Success as Afghanistan Draws to a Close, by MAJ Frank Lazzara, USAF, Naval War College, Newport, R.I. May 4, 2012, pages 9-11. 2. A solicitation for Radio In A Box (RIAB) by the Army Contracting Command posted on the fbo.gov website accessed here and here. 3. For RIAB cost figures see In Afghans fight, U.S. takes to the airwaves, The Washington Post, August 25, 2011. These figures may reflect the contract cost of the equipment; but if bought off the shelf and assembled the cost is probably less than $10,000 per unit. 4. For info on TAAC North providing RIAB to the 209th in May 2015 see a Facebook post dated May 21, 2015 by ISAF (RSM). Additional information requested. If you know of any links to websites, publications, content, or news articles about the RIAB please send to the webmaster so it can be added to this webpage.